The November 2017 meeting of North Somerset Cycle Forum considered proposals for cycling and walking improvements between Bristol and Portishead, as part of MetroWest phase 1. Note that these are not part of the current plans which are just about diversions during the 18 month closure of the Pill Path. They are a ‘modest proposal’ put forward by BCyC members in the hope of significant improvements to an increasingly important link, especially in given the explosive growth in use of e-bikes. By way of comparison, if you cycle to work in Xi’an (pronounced ‘chang-an’) in China on a principal cycle lane you will be one of about 1075 cyclists/hour, of whom 750 will be riding e-bikes. The average speed of e-bikes in Xi’an is 23.6 km/h, which is 71.0% faster than that of bicycles. So, in Portishead an e-biker should anticipate a commute of no more than one hour. Great Western Railway (GWR) have announced engineering works over the Christmas period. Some routes will be diverted and buses will replace some trains (the buses can carry folding bikes only). No trains will run on the GWR network on 25 or 26 December, and on 24 and 27 December there will be no trains running between London Paddington and Slough. Some long distance trains will be diverted to London Marylebone. GWR suggest that you can also travel to London on South Western Railway from Reading, or on Chiltern Railways from Oxford. Most services in this area will be diverted via Eastleigh. GWR say train travel into Southampton is available by changing at Salisbury or Eastleigh. will connect from Reigate to Redhill and Gatwick Airport. When buses replace trains we can only convey folding bikes. Please also note that there will be a similar policy in operation in the Swindon, Chippenham, Bristol and South Wales areas later on this year when other big improvement projects take place. 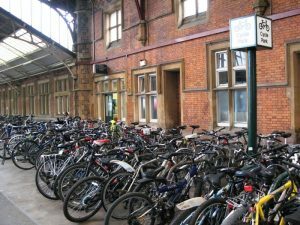 They want to make your cycle-rail journey as simple as possible with the view to clarify information around station cycle facilities, hire schemes nearby and cycle restrictions on board trains. Take their short survey which will take between 10-15 minutes to complete. As a thank you for your time all completed surveys will be entered into a free prize draw where four lucky winners will win £25 worth of Amazon gift vouchers each. The survey and prize draw will close on 31st January. Details of how to enter can be found at the end of the survey.